For every East Village business that’s opening or closing, dozens are quietly making it. Here’s one of them: NYC Velo. Andrew Crooks raced bikes in college and then graduated to become an engineering consultant in Houston, Tex. He was coming to New York City a few times a month when he decided it was time to shift gears, career-wise. “When I made that list of what I’d like to do for 70 to 80 hours a week, cycling was at the top of the list,” he said. 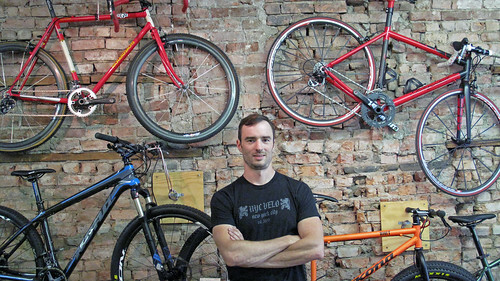 When he opened NYC Velo seven years ago on Second Avenue (a popular commuter route even before it got a bike lane) the East Village’s other bike shops specialized in used rides. On the other hand, NYC Velo’s brand new bikes are priced from $400 to $4,000: hence clientele like Robin Williams and Leo DiCaprio. We asked the bicycling enthusiast turned entrepreneur how he’s managed to make it. Have the bike lanes brought you more business?